This weekend (16 December) its the 40th anniversary of the opening of the Piccadilly Line’s extension to Heathrow. Previously it had opened between Hounslow West and Hatton Cross on 19 July 1975, heralding the first new tube since the Victoria Line. Prior to the Heathrow line’s opening, one had to get the A1 express bus from Hounslow West (see my older post on this.) When the line was extended to Hatton Cross the A1 operated from this new station in order to continue the onwards link with the main airport area. This state of affairs continued until December 1977 when the line was finally completed and opened to Heathrow Central. The line from Hatton Cross to Heathrow was constructed with the help of tunnel shields (apart from Heathrow Central/Terminals 1, 2, 3, which was built using the box method. The earlier section from Hounslow West was built by cut and cover, made possible only because the lie of the land above was alongside the area’s main roads. The opening of the Heathrow extension in 1977 was a historic occasion, being very the last occasion the Queen opened a new tube line, although she has continued to participate in other official duties related to London’s transport system. When the loop line to Terminal Four came on stream Heathrow Central became known as Heathrow Terminals 1, 2 and 3. The picture below shows Charles and Diana in the train cab for the T4 extension. On the opening day itself, the Queen travelled between Hatton Cross and Heathrow Central. The driver was Charles Belcher (or Belsher) and the official was J.Graeme Bruce, at the time the Chief Operating Manager (Railways) to London Transport. Bruce’s job was limited to the few minutes during which the Queen travelled in the cab of the opening train. The tweet below shows the Queen in the train’s cab at Hatton Cross prior to departure for Heathrow. Prior to the Royal opening there had been a strike by LT engineers and many of the escalators on the new line were not quite ready. However two escalators were made complete and in full working order for the Queen’s visit. Upon arrival at Heathrow Central just after noon, the Queen officiated in further ceremonies and was given demonstrations on the workings of the new ticket barriers and the information panel, known as a passenger route indicator. Despite the latter being demonstrated to the Queen, it was available in two European languages only, one of which was German. Ironically The Queen had earlier also saw the failings of the system when the machines refused to accept the official Royal party’s tickets at Hatton Cross. A reception in Terminal One followed the official opening ceremonies. Although there was a plaque commemorating the opening of the extension and Heathrow Central station, its no longer anywhere to be seen. Staff informed me they did not know of its whereabouts. Compared to the Victoria Line the new Hatton Cross and Heathrow stations were a different build with larger spaces and better passenger distribution areas. In other words the station platforms were unique on the underground in being entirely open plan rather than within a pair of tunnels. The only time this was done is when Charles Holden designed the stations at Redbridge and Gants Hill in the 1940s. The Jubilee Line (Bond Street to Charing Cross) reverted to the old style of station tunnel with limited passenger distribution areas. It was not until this was extended eastwards that traditional tube station design was ended entirely, so the Heathrow stations were unusual as an interim design until the newer Jubilee Line stations such as Bermondsey and Canary Wharf were built. Even though the Piccadilly Line and Heathrow services are in the hands of the now venerable 1973 tube stock, it is known the older tube trains, both 1938 and 1959, actually worked the Heathrow branch. Several trains of 1938 stock were still in use on the Piccadilly when the line to Hatton Cross was open and there are observations of these trains here, with the last ones reaching this point in December 1975. By 1977 most of the line’s trains were 1973 tube stock however some 1959 tube stock continued in use. These too reached Heathrow Central, with some observers commenting their first ride on the new line that day of opening was with 1959 stock. 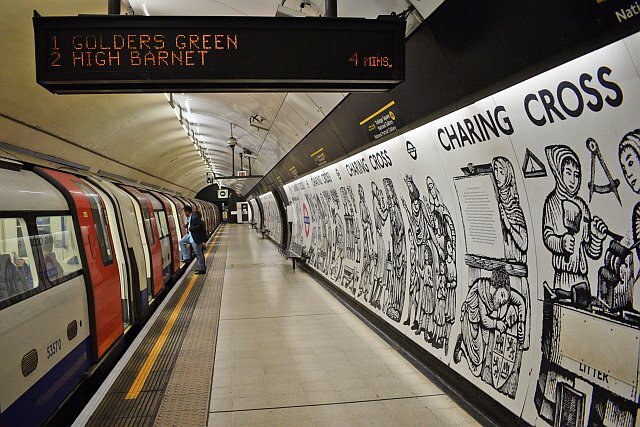 ‘Fly the tube’ and many other posters connected to the airport’s tube service have made much of the fact Heathrow is connected to Central London and the rest of London’s underground system. Yet ever since the start of services in 1977, these have been unreliable with sources clearly noting the huge amount of cancellations that occurred in 1978 alone. Even forty years on in 2017 on most days its not even a considerably reputable service. In retrospect the older combined District and Piccadilly Line services to Hounslow West, along with the express buses from the latter, were more than sufficient to manage the Heathrow traffic. In fact traffic levels were not really sufficient enough to warrant two lines being run out to Hounslow West. The District Line lost its Hounslow services in 1964. Interestingly this was just before the huge boom in air travel, and it may have been if the District had held on a bit longer we would be seeing a much better service to Heathrow in the form of larger trains and even now the modern air conditioned S-Stock. We do know London Transport had the opportunity to build full size railway tunnels to Heathrow ready for the eventual time when that necessity may have arisen, and thus District Line services, instead of the Piccadilly, would be serving the airport. Officials at the time however decided to make the new line tube sized only and there’s been regret that this decision was ever made. Despite the fact the Piccadilly could manage the Hounslow/Heathrow/tube/bus traffic quite well, the old order of taking the tube to Hounslow and then bus onwards to the airport eventually showed its limitations as passenger numbers increased during the later sixties airline boom. Evidently a direct connection was the answer, and this is how the Heathrow extension came into being. The regret however is as has been mentioned, it was not built to accommodate sub surface stock. During the course of the 1970s the old transport order reliant on dedicated bus services to the airport was shut down. The West London Air Terminal closed in 1974 (however express coaches continued from West London until 1979.) The replacement Piccadilly Line was extended to Hatton Cross (1975), Heathrow (1977.) The A1 local bus service was then ended. New services, known as Airbuses A1, A2, from King’s Cross, Victoria etc, were introduced in 1981 but withdrawn in 2004. Heathrow Express (and Heathrow Connect) have been running a number of years now. In late 2018 Crossrail will be serving Heathrow (though not with direct services until later in 2019.) The advent of Crossrail (or the Elizabeth Line as it will be touted) will clearly offer some respite for the Piccadilly Line, a much maligned, unreliable and considerably hated tube service. Ironically the tube that would benefit most from wholesome and direct relief is the Piccadilly yet it does not even have any interchange with Crossrail! So we have a full year to wait before we can even see any indication as to what sort of relief the Piccadilly will gain from the new Crossrail services.